Inspirational speaker Zig Ziglar passes away. â€œFiscal cliffâ€� directs more attention to year-end tax planning. 4th quarter corporate estimated tax payment due December 17. 4th quarter estimated tax payment for everyone else due January 15. California passes individual tax increase. Some multiple-state businesses will pay more income taxes under California Proposition 39. California changes non-recourse rules for refinancing. Time to make year-end related party payments for certain calendar year corporations & pass-through entities. Have you taken your required distribution for 2012? Standard mileage rates announced for 2013. Visit our new article: Ultimate Guide to Facebook Advertising. 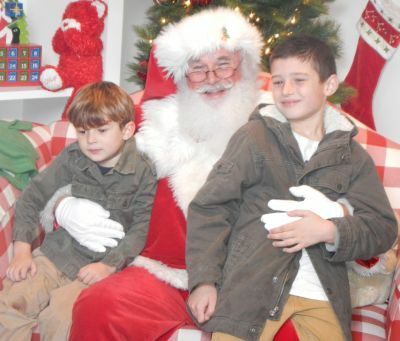 My grandsons Kyan and Clive Baker with Santa. We hope you and your family enjoy a happy and safe holiday season, and that 2013 will be a health and prosperous year for you. Our office will be closed December 24, 25 and New Yearâ€™s Day. Dawn Siemer will be on vacation for the last week in December. With the holidays and continuing education classes in preparation for tax season, Michael Gray will have very limited availability for year-end tax planning meetings. Reserve your appointment now by calling Dawn Siemer on Mondays, Wednesdays and Fridays at 408-918-3162. Call Michael Gray directly on the days he is in the office after December 25 at 408-918-3161. Michael Gray is interviewed on â€œReal Estate 360â€�. A one-hour radio interview of Michael Gray, mostly about investing using Roth and IRA accounts, by Lori Greymont on the â€œReal Estate 360â€� radio show will be broadcast on KDOW, 1220 AM, next Thursday, December 13 at 3 p.m. Pacific Time. KDOW is broadcast from Palo Alto, and can be heard throughout the San Francisco Bay area, and is also broadcast online at www.kdow.biz. Michael Gray was quoted in the page one San Jose Mercury News article, â€œCoveted tax break in peril?â€� on Wednesday, November 28, 2012. The article was about a federal proposal to reduce the mortgage interest deduction. As you know, more and more people are going to the internet to find information about service providers. We hope you will share some good words about good experiences that you have had with our firm. Some of the sites where you can share your experiences include www.yelp.com/biz/michael-gray-cpa-san-jose, siliconvalley.citysearch.com/profile/1120104/san_jose_ca/michael_gray_c_p_a_.html, and Google+ at https://plus.google.com/104281496380131294416/about?gl=us&hl=en. Zig Ziglar, who was born in poverty but rose to become an exceptionally successful salesperson, popular sales trainer and inspirational speaker, passed away on Wednesday, November 28. He was age 86. Zig had an evangelical style and Christian commitment that people either loved or disliked. Two of his slogans were, â€œIâ€™ll see you at the top!â€� and â€œYou can get everything you want in life if you just help enough other people get what they want.â€� He shared the stage with celebrities and U.S. Presidents at Peter Loweâ€™s Success events. Zig will be missed, but his legacy lives on in his books and video and audio recordings. I personally have studied Zigâ€™s material for more than 26 years and found it very practical and helpful. Most of us know the Bush federal tax cuts are scheduled to expire after 2012. In addition, a â€œpatchâ€� for the minimum tax exemption hasnâ€™t been enacted for 2012, potentially exposing millions of taxpayers to an alternative minimum tax liability. Congress has made little progress since the election to solve these problems. As a result, unusual tax strategies are being examined, including considering accelerating income to 2012 and selling investments to report long-term capital gains in 2012. Also, individuals with large estates are aggressively making gifts in 2012. Consider discussing these issues with your tax advisor. Fourth quarter calendar year corporate estimated tax payment is due December 17. The final 2012 estimated tax payment for calendar-year corporations is due December 17, 2012. Not all corporations can base their federal estimated tax payments on the previous yearâ€™s income tax return. For example, new corporations and corporations that had no tax liability for the previous year must compute their estimated tax using the current yearâ€™s facts. See your tax advisor for assistance. The final estimated tax payment for individuals and calendar-year estates and trusts is due January 15, 2013. Remember California taxpayers with taxable income of $1 million or more must pay their estimated taxes using the current yearâ€™s facts. California passed a retroactive tax increase in the last election. There is no penalty for not paying the additional tax with your 2012 estimated tax payments, but you might want to do it for a deduction on your 2012 federal income tax return. Watch the alternative minimum tax. See your tax advisor. The first property tax payment for the 2011-2012 fiscal year in Santa Clara County is due December 10. Avoid a late payment penalty â€“ mail your payment early! Californiaâ€™s Proposition 30 passed in the November election. The proposition included a Â¼% sales tax increase effective January 1, 2013 and expiring after December 31, 2016. A privileged few will be affected by changes in the income tax rates, retroactively effective January 1, 2012 and expiring after December 31, 2018. Tax rate increases apply for singles and married persons filing separately with taxable income over $250,000, heads of household with taxable income over $340,000 and married persons filing joint returns with taxable income over $500,000. For more details, see my blog post, â€œWill your taxes be changed by California Proposition 30?â€� at michaelgraycpa.com/2012/11/08/will-your-taxes-be-changed-by-california-proposition-30/. California passed Proposition 39 in the November election. Under this proposition, businesses headquartered outside California will probably pay more income taxes, but the method for computing California income taxes for some California businesses may change, too. For more details, see my blog post, â€œHow will businesses be affected by Californiaâ€™s Proposition 39?â€� at michaelgraycpa.com/2012/11/09/how-will-businesses-be-affected-by-californias-proposition-39/. Governor Brown approved Senate Bill 1069 on July 9, 2012. Effective January 1, 2013, a refinancing for a California dwelling for not more than four families occupied entirely or in part by the purchaser will still be nonrecourse for the portion of the loan principal refinanced that was a purchase money mortgage. For example, Sally Smith bought a home in 2010 for $500,000, for which she borrowed $400,000 on a mortgage secured by the home. On February 1, 2013, she refinances the mortgage, with a current balance of $395,000, and replaces it with a new mortgage for $450,000. $395,000 of the new mortgage is nonrecourse, and $55,000 of the new mortgage is recourse. â€œNonrecourseâ€� means the lender can only look to the residence for recovery of the principal in the event of default. The tax result is explained in my article, â€œTax consequences of a â€œshort saleâ€� of real estate v. foreclosureâ€� at www.realestateinvestingtax.com/shortsale.shtml, soon to be updated. Itâ€™s unclear whether the new rule will apply for subsequent refinancings or can only be applied once. We recommend that you always consult with a real estate attorney when planning a short sale or foreclosure. Have you taken your required distribution from your retirement account or IRA for 2012? Calendar year businesses with inventories should take a physical count as of January 1. This creates a â€œcleanâ€� record for the income tax return. Itâ€™s the season for giving. Many of us make extra donations during December to share our bounty with others. Appreciated publicly-traded stock that has been held for more than a year is an ideal asset for a donation. Under the Internal Revenue Code, the long-term capital gain is excluded from taxable income and the charitable contribution deduction is the fair market value of the stock, so there is a double tax benefit. Also, publicly traded stock isnâ€™t subject to the appraisal requirements that apply for other property. Itâ€™s a win-win-win! Remember to get a good acknowledgement letter to document the donation, including a statement that â€œno goods or services were received in exchange for the donationâ€�. The business standard mileage rate is being increased from 55.5Â¢ per mile for 2012 to 56.5Â¢ per mile for 2013. The standard mileage rate for medical and moving expenses is being increased from 23Â¢ per mile for 2012 to 24Â¢ per mile for 2013.